Hello! I hope you all had a fabby weekend! We had a busy but fun weekend :) It has gotten HOT down here in Florida, so we had some pool time and went blueberry picking down at a friend's farm which the kids loved! I even got to go wedding dress shopping with a good friend of mine, and we found her the PERFECT dress!!! It was so much fun! Speaking of fun, I had a blast playing with my new Verve stamp set called Relax :) I made this for the Embellish Magazine Color Challenge to use Sea Foam, Brown, Green, and Terracotta. We were also to add dimension to our projects, so I cut out and popped up the sun, the palm tree, and the sentiment panel. The dp is October Afternoon Fly A Kite and the layout is this week's Sketch Challenge on SCS. Beautiful card with very good-looking papers!! I like the string around the blue paper! I'm in love with this card! Seriously, I would marry it if I could! LOL It's beautiful! I love this Kerri! So cute!!! Love this card Kerri! I'm waiting for the sun to shine here, we've had strange cold weather this spring. This is just fantastic! I love it! ..now this is just too CUTE! Wouldn't this be GREAT on the cover of a summer journal book...where you could post summer photo's inside! Oh my word Kerri this is FABULOUS!! LOVE this beach themed creation...Those papers are AWESOME and that sun, and palm tree looks GREAT!!! Great card Kerri. It looks so summery! I love those papers you used too. 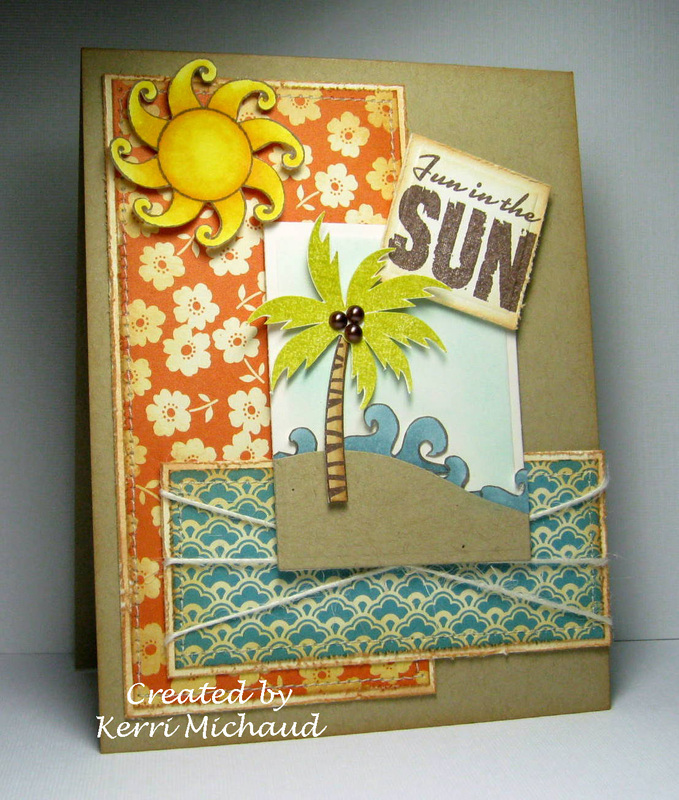 Love your beach theme with these colours Kerri! Awesome paper and wonderful scene you've created. Great coloring...love all the antiquing/distressing paired with kraft....and what you did with the twine is fun. We need to go blueberry picking...think we usually go Labor Day-ish though...yum! Fabulous card! I love the dimension and the colors! The sketch is wonderful - really, this entire card just rocks! Love It !! As always I love the paper you use!! I love this dp. It is so pretty! I like the popped up sun and palm tree. And I'm jealous of all your heat. Well, truth be told I can't handle Florida heat and humidity. But I'd like something besides rain and gloomy weather! How fun to go wedding dress shopping. Especially finding the perfect dress!!! Fabulous summer card! I love shopping for wedding dresses, glad you had fun and found one with her. This card just screams Florida!!! Mega super indeed! How fun! Now I'm ready to go to the beach! I love your fun card! I love that palm tree, and sun!